This winter, I took a trip to San Miguel, Mexico. This colonial city bursts with color, and it’s not unusual to see homes painted in bright yellow, reds and greens, enhanced with beautiful foliage. The many shops display handcrafts that reflect Mexicans love of color. When I returned here to the desert, I realized that our homes are painted to blend into the landscape, so color must occur inside. That’s where art comes in. Many painters, especially those at Wilde Meyer, enjoy expressing themselves through the use of bright color. The gallery is known for its artists’ love of a strong palette, expressed in a variety of styles. 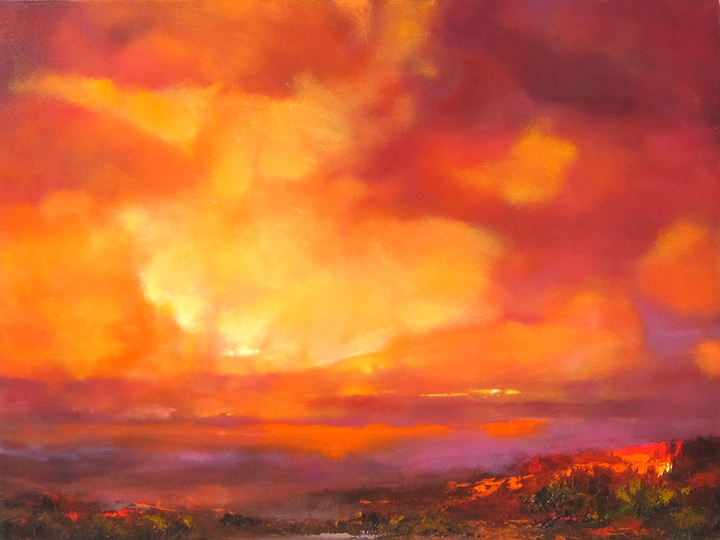 Cathy Carey describes herself as a “contemporary expressive colorist,” and says that she strives to “use color to create emotional meaning and visual depth.” Although Cathy paints landscapes, she doesn’t use much local color. Instead, her goal is to communicate what the scene feels like to her, using strong hues. Cathy is very knowledgeable about color theory, and works with contrasts, such as warm against cool, light against darks, and brilliant hues adjacent to neutral tones. Her painting entitled “For Evermore” illustrates this technique. The purple mountains and vegetation pop against the bright yellow sky and paler yellow foreground. The tree trunk texture is created by warm hues against cool ones. Adding to the vitality of the painting are her beautiful brushstrokes, which remind me so much of Van Gogh. Cathy told me that she is very influenced by the impressionist and post-impressionist masters. She said that Monet’s writings about color and composition are of particular importance to her. “I’ve learned to use diagonal shapes to guide the viewer’s eyes, and to circulate a color throughout the painting to create a unified look,” she said. You can see these ideas expressed in her painting entitled “Sounds of Life.” The diagonal movement of the painting images takes our eyes upward at first glance; then we can focus on the shapes, and see the animal curled up among the plants. Cathy uses her blues and greens in different areas, which unifies the painting, and the pop of red/orange against the greens enlivens it up. Her energetic brushstrokes, reminiscent of Van Gogh’s, really make the painting appealing to me. Jack Roberts also strives to create a visual sensation through color. He, too, wants to stir the viewer’s emotions, and says that his abstract paintings are about pushing color and shape buttons. Jack works on a large canvas, on a flat surface. He says that he likes to paint wet-on-wet, so the paint is always moving. He uses many different implements, from plastic spatulas to push brooms and house paint brushes. A garden hose is used to remove paint in some areas, and reveal other dry paint underneath, to create the layers he wants. I’m a person who thrives on color, so I’m very drawn to Jack’s paintings. As you can see in his painting entitled “Acoma,” his colors are very clear; he mixes beautiful opaques with jewel-toned transparent hues. Like all of us color-obsessed painters, Theresa says that she is inspired by the Fauves and Post-Impressionists. 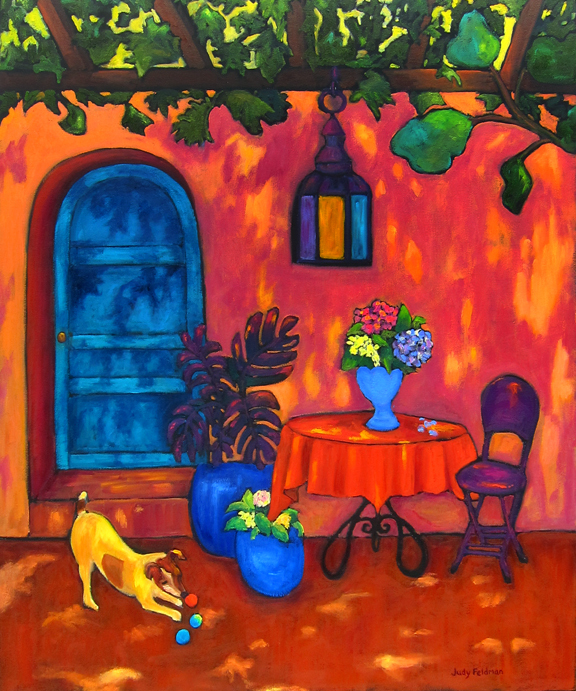 She adds that her color palette had been initially inspired by a trip to Santa Fe, when she was so enchanted by the light and the colors of the city, especially turquoise, red and coral. You can see this influence in her painting entitled “Bison on the Move.” The bright turquoise on the animal’s head and light yellow on its back tells us that it’s in sunlight. 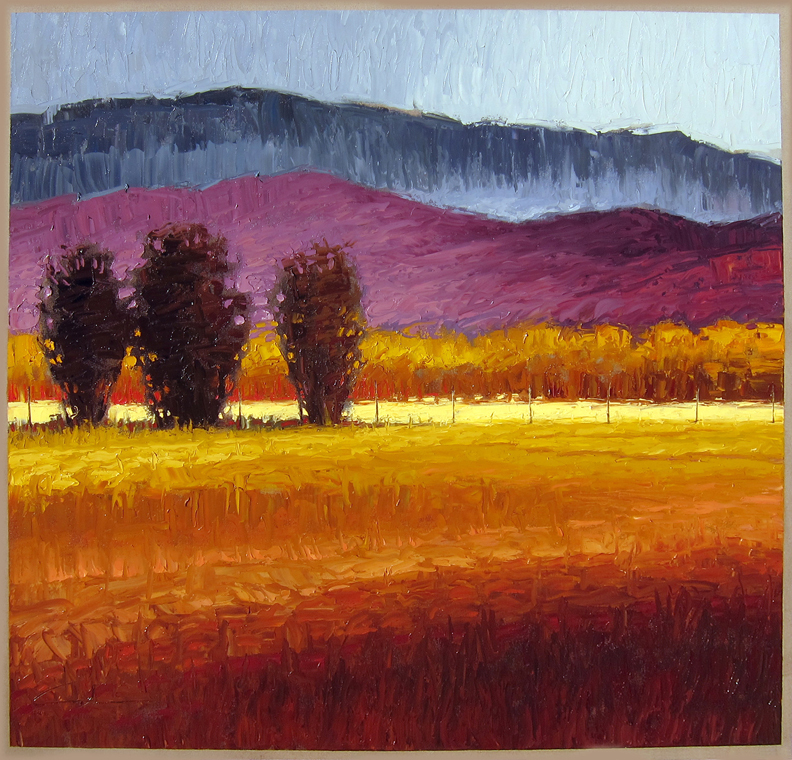 These colors, along with warm reds and browns enliven the painting and give it a contemporary look. Playing with color enables artists to explore creative possibilities and convey their emotions. Even though people say that “art imitates life,” I think that strong color can make art much more interesting than what we see! 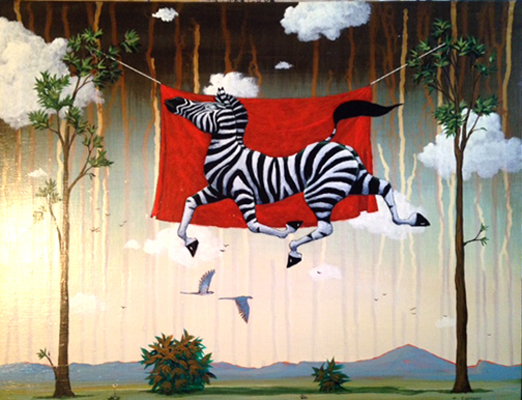 You can see more work by Theresa Paden, Jack Roberts, and Cathy Carey at Wilde Meyer Gallery. Can dilly-dallying help the artistic process? I’ve been thinking about writing this blog for a while. But different commitments and distractions have gotten in the way. Is that procrastination? Sometimes, that happens before I start a painting. Then, I can really procrastinate, with laundry, gardening, cooking, whatever is a good stalling technique. When people ask me how long it takes to do a painting, like “Morning Shadows,” I guess I have to add a few hours to the process. Why do creative people procrastinate? Is it productive? I had to ask some fellow artists. Timothy studied biology in school, and is fond of depicting animals in his own way., which, according to him, is “basically inaccurate, by using humor, irony and a surrealistic sensibility that is not available to a scientist.” So part of his process involves looking through reference material – often Victorian animal portraiture – and then doing some sketches, before going on to a canvas. “Sketching deflects procrastination,” he explains. Great idea! Once Timothy examines old animal engravings and starts riffing on their weirdness (these illustrators rarely saw the real thing), he gets his ideas. How to explain “Zebrid Display Tactics” except to note how wonderfully the red blanket shows off the black and white stripes. And, what about the flying? “Gravity is optional is most of my paintings,” he says. Levitation is also present in “Evening Guardian Ritual,” a mélange of species and patterns. Timothy says that these patterns develop as he is painting, as do the drips that dribble down from the sky. Albert’s luminous cloud paintings, such as “Landscape 868” convey a dreamy state of mind to me, stimulated by a beautiful sunrise or sunset. 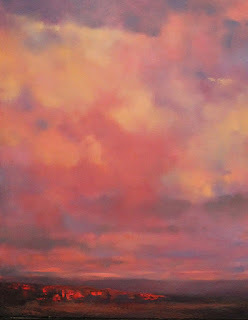 His very low horizon, with just a hint of land, gives lots of room for his ethereal clouds. Looking at “Landscape 802,” I feel as if they are moving across the canvas. The glowing highlights on the ground below seem to reflect the setting sun. 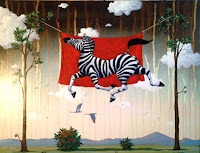 Jeff Cochran, the third artist I called, seems to have a good handle on procrastination. “I basically make myself sit and drink coffee until I can’t sit anymore,” he says. I’m guessing that enough caffeine will propel him into his studio. 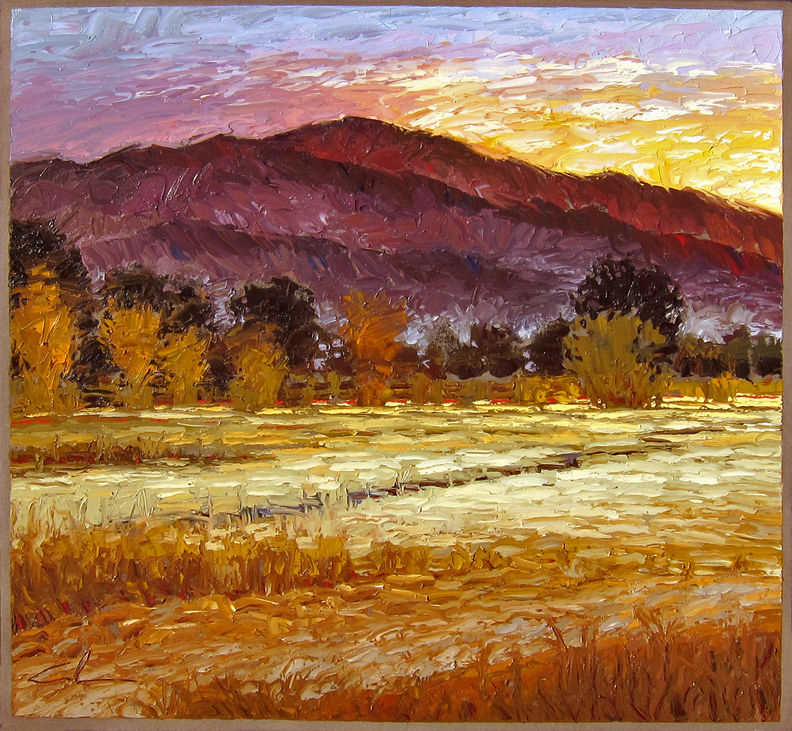 Since his move to Taos, New Mexico, Jeff has been painting landscapes of areas surrounding his home. 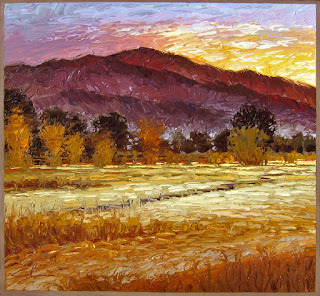 So he does need to muster up the energy and enthusiasm to load up his van and get out to do the plein air studies he paints, before doing the larger ones in his studio. Jeff is single, so he can do things like make his recent impulsive trip to the Baja in Mexico, set up camp and paint a while with no distractions. But, maybe I’m just rationalizing. Maybe some of us creative types are just super skilled at creating techniques for delaying the work we love. You can see more work by Timothy Chapman, Albert Scharf, Jeff Cochran, and Judy Feldman at Wilde Meyer Gallery.